Start printing those coupons. This printer can save you thousands. 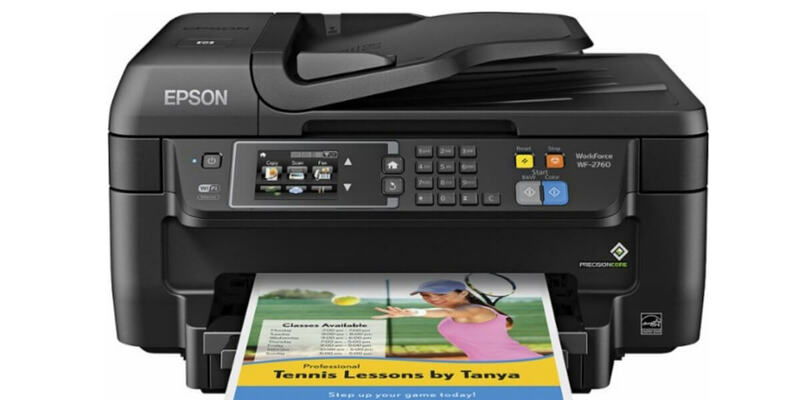 Epson WorkForce WF-2760 Wireless All-In-One Printer $59.99 (Reg. $129.99) + Free Shipping from Best Buy! Prints up to 13.7 ISO ppm* in black, up to 7.3 ISO ppm* in color To generate documents quickly. 4-in-1 functionality Copies, faxes, prints and scans to accommodate your business and personal needs. Compatible with Google Cloud Print ready For simple printing from your smartphone or tablet. 4 individual print cartridges are economical Only replace ink cartridges (black, cyan, magenta and yellow) when a color runs out. Supported media sizes ANSI A, Legal, A4 and A6. 2.7″ touch screen Makes operation simple. Print on both sides of the page without turning it over manually, to minimize your printing costs and help the environment. More print, copy and scan solutions Automatically print 2-sided documents, scan documents to your computer or directly to e-mail and more. Copies up to 11 cpm* in black, up to 5.5 ISO cpm* in color To ensure efficient performance. High-speed fax With 33.6 Kbps modem, 100 speed dials and automatic redial to meet your office needs. Scanner with color CIS (contact image sensor) Allows you to scan documents in up to 1200 x 2400 dpi optical resolution and up to 9600 dpi interpolated resolution, so you can enjoy faithful document reproduction.